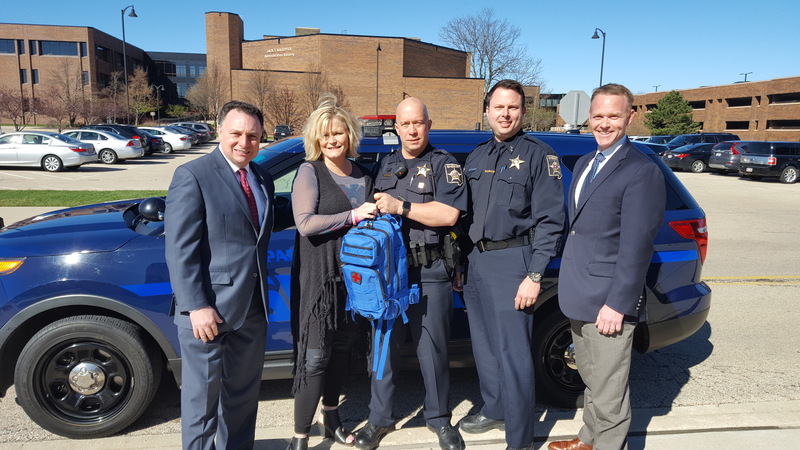 Pictured with Deputy VanDeVoorde are from left to right, County Board member Pete DiCianni, Shelly LeGere, Undersheriff Frank Bibbiano and Chris Hoff of the DuPage County Health Department. Undersheriff Frank Bibbiano is proud of the relationship that was forged between the Sheriff’s Office, Shelly LeGere, County Board member Pete DiCianni, Senator Chris Nybo and the DuPage County Health Department. Bibbiano said, “It’s this collaborative effort that really paved the way for this significant moment in law enforcement. I would like to extend my gratitude to Shelly LeGere, County Board member Pete DiCianni and Senator Nybo for their tireless efforts to get the EpiPen in the hands of police. Shelly is the mother of Annie LeGere, who passed away in August, 2015, as a result of anaphylactic shock due to an unknown allergic reaction. Shelly started the Annie LeGere Foundation, www.AmazingAnnie.org, which promotes allergy awareness and research, educates parents and children about the signs and symptoms of allergic reactions and what to do when they occur. Furthermore, the foundation supports training of first responders and school staff in the use of epinephrine auto-injectors. Shelly also spearheaded efforts with Senator Nybo and County Board Member Pete DiCianni to get “Annie’s Law” passed in Illinois. “I’m honored to see the DuPage County Sheriff’s Office be the first to implement our EpiPen pilot program,” said Nybo. “By making this commitment, they’re taking an active stance to reduce allergen-related deaths in our community—which are highly preventable, like in the case of our own Annie LeGere.